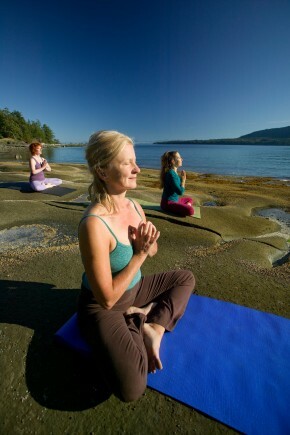 Yoga is booming everywhere, but especially so on the 51-square-metre rain-forested rock known as Denman Island. Observers say this small community of 1100 has the highest per-capita ratio of yoga teachers in the whole country. Actually, no one keeps such statistics, but empirical observation leaves no doubt that this Gulf Island is rich in yoga resources. “There is an amazing number and variety of really excellent teachers in a concentrated area, and so many studios in such scenic locations—it’s really something special,” says teacher Jennifer Lee. “It’s a yoga island,” says George McFaul, who with his wife Laurie owns and teaches at Shanti House studio. Denman Island hosts three public yoga studios with ongoing classes, a number of more private yoga spaces, a Buddhist Centre that sometimes includes yoga in its retreats, and, according to my research for this article, 14 yoga teachers—that’s one per every 79 residents. I am one of these yoga teachers. The idea to write about my yoga community came to me one day on the big ferry from Nanaimo to Vancouver, on my way to take a weekend yoga workshop in the big city. Out of the blue I had a brainstorm: why am I spending all this money and time to study yoga elsewhere, when I have so much yoga right in my backyard? After all, people come from all over to study yoga on Denman. The Island is attractive not just for its teachers but also the setting. In the yoga world of Denman, everything is small-scale and intimate. There’s no need to book your mat ‘parking space’ online, as, apparently, happens in Los Angeles. When you practice yoga on this Island, nature is right there: as you settle into a resting pose, the steady rhythm of your breath seems to match the sway and swish of the Douglas firs in the wind. As you ground through the feet in Mountain Pose, you see a mama deer and fawn gazing back at you through the window. And as you stretch the spine in Downward Facing Dog during an evening class, the hooting of an owl pulls you into connection with the mystery and magic of life. In summer, you can easily practice your way into bliss on a quiet beach, and in winter, the rain lulls you into a luxurious puddle of calm as it patters on the studio skylight. But beware—this is real nature. You might want to wear gumboots on rainy days, and bring a flashlight at night so you can find your way from the class back to your car. As I think about the charms of my Island, revisiting in my mind the amazing Denman yoga studios I’ve been to, and wondering about the ones I’ve never seen, I get an idea: I’ll go on a ‘yoga tour’ of my own home, sampling every teacher available, and spending time chatting with the other teachers and students about yoga and the Island. It makes sense to start on a Monday morning, with a class taught by Fiona Walker. Like a number of Denman classes, this one is not advertised. This is not meant to be exclusionary but rather is a practical response to teaching in a small space and in a community where the most important information generally passes by word of mouth. I know about Walker’s class from some of my own yoga students, who attend her class as well. I have no problem finding Walker’s driveway; a fiery red dragon emblazoned on a sign welcomes me to Kang Ren Clinic. This signifies the Chinese Medicine practice of Willo Walker, Fiona’s partner. It is also where Fiona practices and teaches massage, and where the Walkers live. The studio is wonderfully warm, with sliding glass doors at both ends, one opening onto a greenhouse and the other to the green world outside. The class is deeply meditative and lasts for over two hours. Walker encourages us to make sounds, to move spontaneously, to follow our body’s desires as we practice. It’s a marvellous way to start my yoga week: a practice that goes straight to one of yoga’s deepest truths—that turning inward is, paradoxically, a powerful way to experience our essential connection to all of existence. When I finally emerge from the studio, I feel incredibly calm, refreshed and peaceful. Tuesday morning feels like a good day to go The Barn studio, where Alison Yarwood teaches yoga in the Iyengar style. She started teaching about 13 years ago in the cavernous Denman Seniors’ Hall, and, in 2003, opened up her own cozy, well-equipped yoga studio right next to her home on Swan Farm. The woodstove, the simplicity, and the forest close by gives this studio a cabin-in-the-woods feel. Unlike a typical cabin however, this renovated barn is fully outfitted with a variety of yoga props, including ropes, blocks, blankets and straps. The props are an essential part of the Iyengar approach; they are used to support the body in different ways to make poses more accessible. Yarwood’s style is friendly and down-to-earth. This is a great class for learning the correct details of poses and exploring the nuances of alignment. For me, the class makes a satisfying contrast with Walker’s class yesterday; while Walker took me into what felt like a trance, Yarwood engages my thinking mind as I follow her clear, thorough instructions about just how to place my body, what muscles to engage and what muscles to release. Yarwood teaches six classes a week at The Barn and has a dedicated following; some students have been attending her classes for more than a decade. As well, she sometimes teaches yoga and meditation workshops at The Hermitage, a non-profit Buddhist retreat centre on Denman Island. Ideally, on Wednesday morning I’d head to a restorative yoga class with Sandy Melnyk. But when I call her she says her class is full with preregistered students. Too bad! I’d love to take a class with Sandy, who I know as empathetic, warm and highly knowledgeable. Thursday morning my yoga tour turns the tables a bit—it is my day to teach at the Shanti House yurt. This studio, which opened last spring, is attached to a B&B, which makes it ideal for retreats and workshops (this summer I taught my annual Yoga Intensive there; it was the perfect setting). I love teaching at the yurt. I love the mandala pattern made by the smooth cylindrical wooden rafters as they connect to the central skylight, the spacious windows, the heated floor, the views of garden and forest through the windows, the sense of community created by the circular space. My Thursday morning class is YogaFlow for Strength, a relatively fast-paced class where we move from posture to posture without much pause. This is a fairly new departure for me; lately I’ve been excited by the experience of strength in my yoga practice and am enjoying sharing that with students. More often I teach a slower, more detailed Hatha yoga style with emphasis on the power of breath, energy awareness and the cultivation of deep release. I’m amazed by the way working with our bodies can so profoundly affect us on psychological, emotional, and spiritual levels. My great joy as a teacher is guiding students to connect inner focus and intention with skilful physical practice in order to experience the many fruits of yoga—healing, connection, equanimity, open-heartedness, self-acceptance and personal power, to name a few. Thursday evening I get to be a student again, heading out for a class with Hari Amrit Khalsa. She and her partner Devmurti are long term devotees of Kundalini Yoga as taught by Yogi Bhajan; the two of them studied with Bhajan for close to 20 years in New Mexico. In 2006 they moved to one of Denman’s oldest farms, where they grow hay, vegetables and herbs—and teach yoga. Soon after acquiring the property, they renovated an old machine shed, transforming it into a comfortable studio. As I enter, I am immediately lulled by the soft carpets, soothing music, candles, and the very warm welcome from Hari Amrit and Devmurti. The class includes chanting, rhythmic movement and lots of strong, cleansing breathing practices. It is unlike most other yoga I have done and I am fascinated to find something so new (to me, anyway), so close by. All the practices are designed to achieve a meditative mind, Hari Amrit explains. “The purpose of Kundalini yoga is to raise our consciousness and support our physical, mental and spiritual well-being.” She teaches three classes a week at the studio, and Devmurti teaches a weekly meditation class. Friday morning suggests a return to Shanti House for George McFaul’s class. “I’d describe what I do as a spontaneous, very much breath-based, style of practice,” says McFaul. “I hope to offer ways to access your own inner teacher, using the breath, using embodied experience, using awareness in the body.” The postures and specific practices are not the ultimate goal of yoga, he says; rather, they are a container to hold the experience of being truly, deeply, alive. The class I attend includes a gentle and sometimes playful physical practice as well as a session of Yoga Nidra, one of McFaul’s specialties. Yoga Nidra is a form of guided meditation with a very specific protocol. “Yoga Nidra allows us to experience what our mental, physical and emotional habits are, our patterns of belief; then we can experience what we are if we let go of them,” McFaul says. The Nidra feels like it could change my life, and I want more of it. By now I’m very sure that my hunch was correct—there are enough yoga resources in my backyard to keep me occupied for a long time. The week is over, and there are still yoga teachers on Denman I haven’t connected with. Gillian Saxby has nothing scheduled currently at her spacious studio in the woods. I’ve spent glorious time there in the past at classes and workshops, not just doing yoga but also dancing. Saxby is also a belly dance instructor, and has studied Indian devotional dance. Out of this, she has developed her own unique fusion form she calls YogaDance. She teaches classes, workshops and private and semi-private sessions at her studio and in the North Island area. “YogaDance unifies the disciplines of yoga, temple dance and belly dance through the alchemy of breath and movement,” Saxby says. Jennifer Lee is taking the current session off, but will be teaching at Shanti House again in the new year, and during the summers teaches outdoor classes at Orkney Farm, where she lives. Many Denman yoga teachers teach further afield; if you study yoga in the North Vancouver Island area, you may have been taught by a Denman yoga teacher. For instance, Josey Slater runs the popular YogaStream studio in Campbell River, which offers a full program of daytime and evening classes as well as workshops, retreats and other events. As well, recent graduates of Sandy Melnyk’s teacher training course, Sheila Nopper and Luna Stephanson, are teaching in the Comox Valley area, and will be teaching on Denman in the new year. As part of my yoga tour, I’ve asked all the teachers what, if anything, is special about yoga on Denman. Partly this is because I am fascinated by the whole concept of local, fascinated with how, in a world that is globalizing at a dizzying rate, the confluence of place, community and history that we refer to when we say ‘local’ continues to thrive. Equally, I am fascinated by the journey and history of yoga. There is no doubt that yoga is being changed as it travels the world; for instance, the recent boom in yoga in North America has changed how, where and by whom yoga is done, creating hybrids like Yogilates, YogaKickBox, Yoga Trance Dance and YogaButt Conditioning (no joke), adding accessories like clothing, sticky mats, and toe-separators—and, most significantly, bringing yoga into the mainstream. So I wonder—can we identify particular qualities of Denman Island yoga? Some characteristics seem be determined by demographics: small classes, intimate spaces, and a gentle approach that comfortably incorporates seniors. But perhaps there is more. Jennifer Lee, who taught in Banff for years before moving to Denman, says Denman yoga definitely has a different feel than what she has experienced elsewhere. “I’d describe it as a very feminine style of yoga. It’s very much about the experience in the body, and not so much goal-focused. And all the spaces—the studios—are very feminine, very womb-like; private, soft, protected,” she says. Fiona Walker feels that the remoteness of Denman, the lack of pressure, the remove from full-on commerce, allows teachers to truly come into their own. “While holding reverence for our own teachers, we are able to take our training and tune in to our own style, our own goals, our own yearnings.” That sense of freedom—not having to conform—is passed on to the students. George McFaul, who taught elsewhere in Canada and internationally for almost two decades before moving to Denman, says what he finds notable on Denman is a certain quality in the students, and this, he suggests, comes from a sense of place. “The teachers on Denman are great. Like teachers all over the world, they are very heart-centred. That’s not so unusual. So it’s not so much in the teaching that Denman is distinguished. Rather, it has something to do with the land, the earth, as reflected in the students. The Island is well-known for its Home & Garden Tour and Pottery Tour; there have been successful farm tours and artists’ studio tours, as well as a popular sustainable homes tour a few years ago. “Why not do a yoga tour of Denman?” Lee says. Indeed, I think, smiling. I now know from experience just what a good idea that is.